A taste of Hawaii in Singapore. When I go on holiday I like to relax, unwind and clear my head. 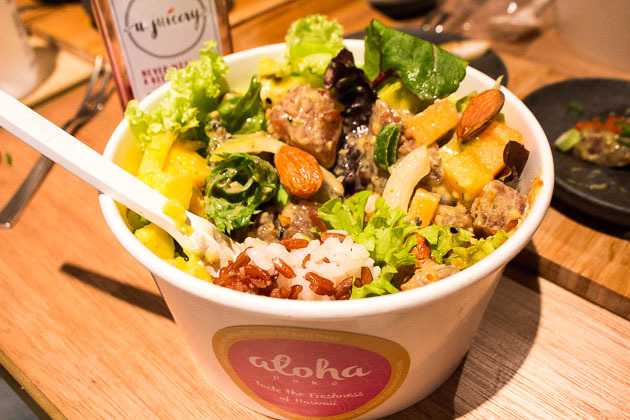 The same cannot be said of the two couples behind the latest addition to Amoy Street – Aloha Poke. 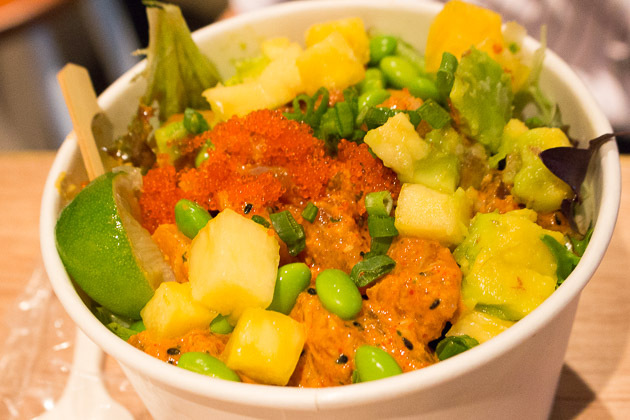 For it was during their last holiday together in Honolulu that the idea for Aloha Poke was born. 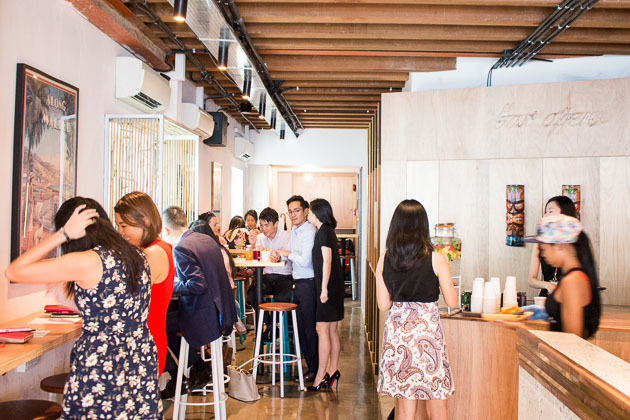 Fast forward 12 months and we found ourselves sitting in this Hawaiian inspired shophouse sampling some seriously tasty food. 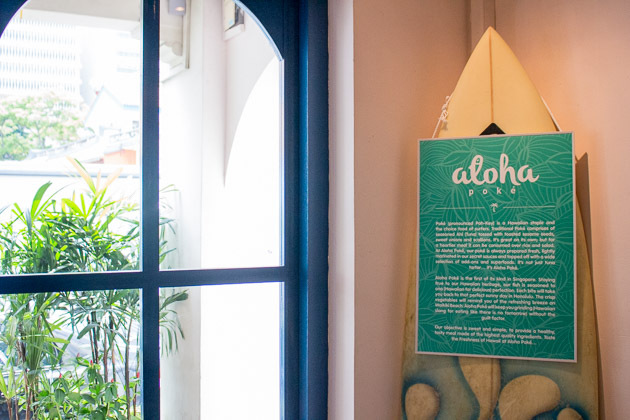 First things first, the interior of Aloha Poke is laid back and minimal with a few tiki touches here and there just to remind you this is in fact a Hawaiian affair. It’s cool and casual and I could totally imagine a few surfer dudes riding through the doors on the crest of a wave at any point. By day this is a great spot for a healthy lunch and a catch up with friends. By night the bar comes out and cocktails are flowing creating a livelier vibe. We stopped by over lunch to see exactly what all of the fuss is about. For those of you not in the know, poké (pronounced ‘poh-kay’) is a traditional Hawaiian raw fish salad, typically made with yellowfin tuna. It’s often found in supermarkets and other casual eateries where diners can help themselves to a scoop, or two, and eat it there and then from a small bowl. 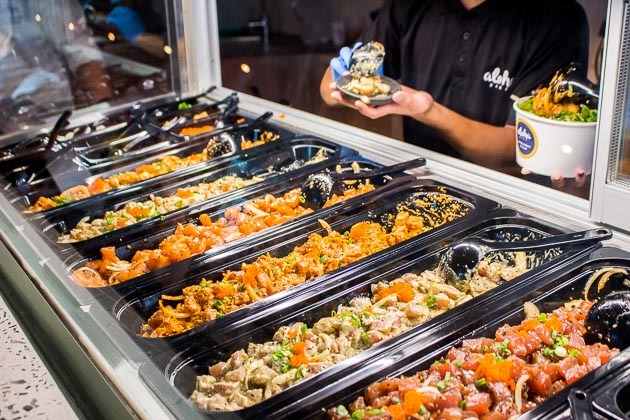 At Aloha Poke, you can get your poké on in numerous different ways. Firstly, you need to choose the size of your portion, which ranges from a ‘Lil’ Swell’ ($11.90, 75g of poké) up to a ‘Big Kahuna’ ($19.90, 225g of poké). Then you can choose from two types of fish – the traditional yellowfin tuna or salmon. We tried both and can’t pick a favourite. The salmon is deliciously fatty and oily, whilst the tuna is dryer. Either way, you can guarantee the fish here is fresh as it’s delivered daily. The fish is flavoured in one of three ways. The original seasoning is a mix of sesame, soju, black and white sesame seeds and scallions. It’s a little nutty, a little sweet and works well with both fish. The second option is a wasabi mayo, the fiery wasabi is tamed just enough by the creamy mayo – again, delicious with both fish. The final option is a spicy seasoning, don’t be fooled by it! The heat kicks in right at the end but if you like it spicy this is the one to go for. Once you’ve picked your poké, it’s then time to decide upon your base, complimentary add on-ons and superfoods. The choices here are vast with everything from white/brown rice, jalapenos, flying fish roe, pomegranate, pumpkin seeds or avocado. 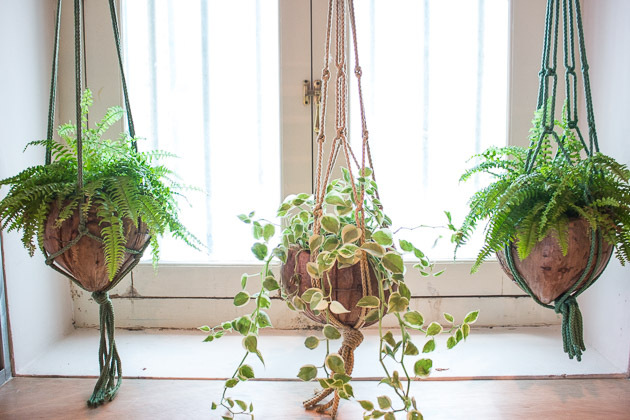 Quite simply, you’ll never get bored as there’s always something new to try. 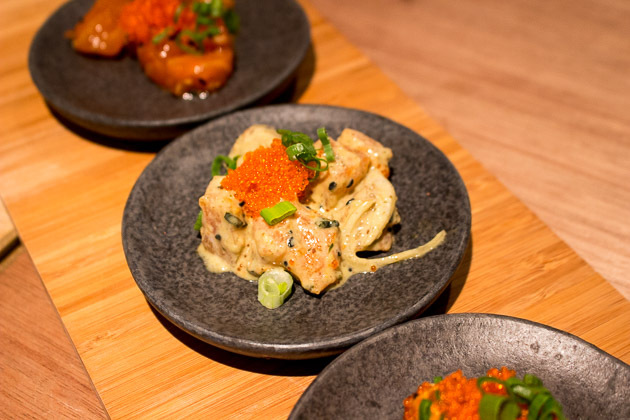 If, however, you’re the indecisive type you can let the chefs do all the work and select a standard tuna or salmon poke which they’ll whip up with all of their classic favourite ingredients. Your poké comes delivered in a cute bowl, whilst it may look small it’s quite incredible how much these things can actually hold. Mine was deceptively full and took me an age to get to the bottom of it. Not that I’m complaining – I’m officially a poké convert. Whichever variation you opt for, this is a super healthy protein packed lunch that will leave you satisfyingly full without that awful bloat. Rest assured, this is not just another average boring salad – it’s fresh, it’s filling, it’s light and it’s bursting with flavour. Even if you’re a salad-phobe I bet you’d be a poké fan. Drinks wise there are numerous healthy cold pressed juices ($7.90) to choose from. In particular, we loved the Citrus Ninja, packed with vitamin C, turmeric and cayenne pepper it’s perfect if you’re feeling a little under the weather. Alternatively if you want to indulge yourself guilt free opt for the choco sutra. Made with almond milk and cacao powder it’s got a chocolate milkshake thing going, minus the calories. Alternatively we could not get enough of the coconut water ($5.90) that is imported regularly from Thailand. 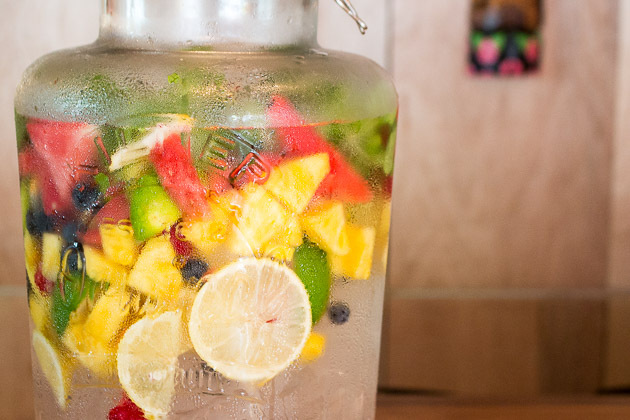 It’s fresh, sweet and thirst quenching. 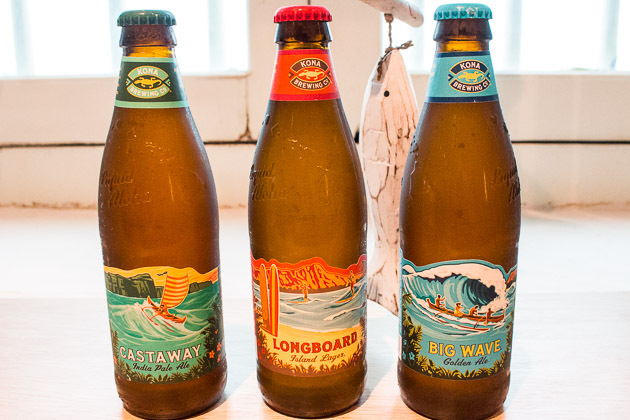 If you’re feeling a little more adventurous we’d highly recommend the Hawaiian ales on offer. The ‘Big Wave‘ golden ale ($13.90) is delicate and fruity with a hint of honey. 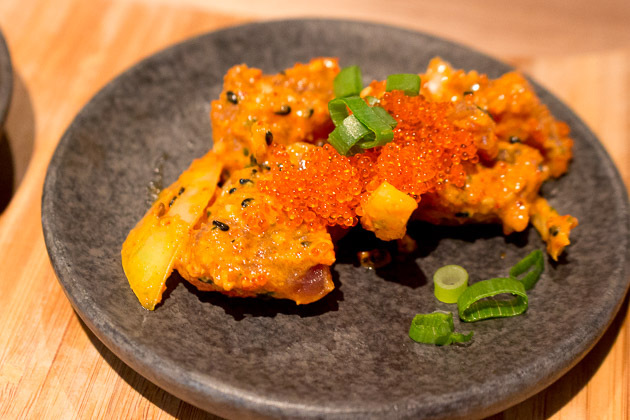 It’s light and refreshing and works really well with the spicier poke options. I hope poké is a trend that’s here to stay in Singapore. It’s healthy, it’s fresh and it’s seriously tasty. 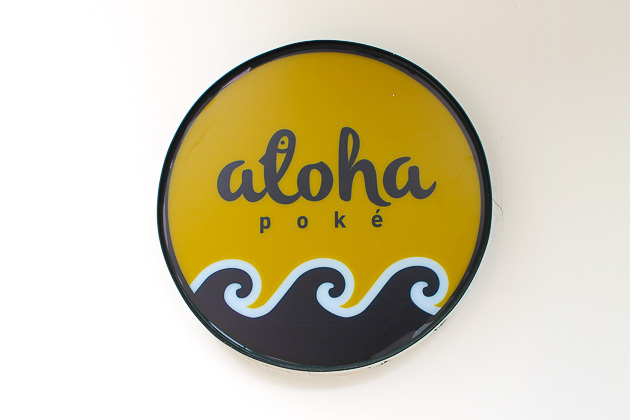 I just wish I lived/worked closer to Amoy Street so I could head over for lunch at Aloha Poke more frequently. 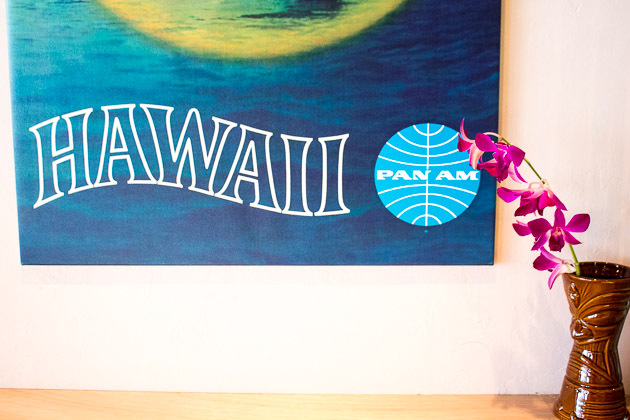 I will, however, be returning ASAP to check out their evening menu which promises bigger portions and some interesting dishes showcasing Hawaii’s favourite meat – spam! Word on the street is the team here will soon be throwing a tiki party as well. I think it’s about time I bought a grass skirt and learnt the hula. In my view this little taste of Hawaii is a welcome addition to the foodie scene here in Singapore. I'm a Londoner currently living in Singapore. You'll usually find me with my dog Buddy in one hand and a glass of wine in the other. When I'm not cooking, I'm eating and if I'm not doing either of those things, I'll be in a karaoke.